Appalachia & Beyond: O&W... Ain't that a root beer? O&W... Ain't that a root beer? It was a beautiful Spring day on March 21, and after making it through the rainy days and the weekly grind, we were itching to get outdoors. 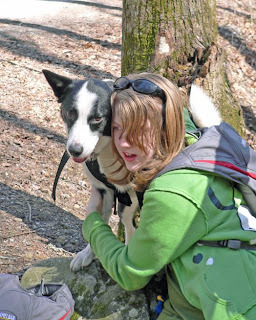 Kiddo's cousin had spent the night (most of the week really, having been their Spring Break and all) and had mentioned the last time she was over that she wanted to go on a hike with us sometime. We figured this would be a good opportunity for that to occur. We had really been thinking about hiking all week. So the day came for the hike. 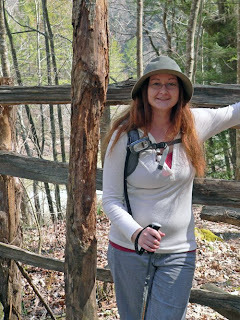 We had decided the night before that we would drive up to the Big South Fork and hike the O&W Bridge trail and cookout some hotdogs upon the conclusion of the hike. With our plans made and packs packed, we all (Robin, Rugrat, Cos, Beene, and myself) loaded up into the car and headed out. We arrived at the Leatherwood Ford area of BSF where we found a parking spot, got our packs on and headed down the trail. O&W is a 2.3 mile in and out trail to the bridge making it a total 4.6 mile round trip. It meanders alongside the Big South Fork of the Cumberland River. It is also a part of the John Muir Trail in the Big South Fork. From the trail you can see all sorts of sights including big rapids in the river, all sorts of wildlife and vegetation, and some amazing geological structures. Upon starting the trail you see evidence of natures best lumberjacks. When asking the kids what might have fell the trees in this area, one reply was a lumber jack. Of course we laughed about that one and properly informed the kids that it was the work of beavers. As we continued hiking we noticed how much higher the river was compared to last year as we had been in bad drought conditions last year which made the river run very low indeed. The trail provided some minor obstacles in the form of creek crossings. These weren't ordinary creek crossings either. Almost every crossing was set in the middle of a cutback on the trail in which you had to hop rocks to cross. I have to say, Beene and I have worked out the best plan to overcome these obstacles. Beene is our Border Collie mix, and she has got to be the best and smartest trail dog ever. Once everyone was across a creek, Beene and I would step up to the creek crossing and I would slacken her leash all the way. Upon command she would run to the other side upon which she would sit and wait with the others while I crossed. There were also some pretty step declines on the way back out as well to which I would let her go first and then I would start after her and stop half way down to stop her from pulling me down with her. Eventually, we got to the point where we would stand at the top of the decline are at a creek crossing, the rest of the group would head down or across and upon reaching the bottom or other side, I would release Beene from her leash and let her go to them. That was indeed the best approach of all. Along the trail we spotted some flowering Yellow Trillium, some sandstone bluffs, a party of rafters and a duo of canoers upon the river. We also crossed paths with a handful of other hikers. At one point along the trail we spotted an animal standing in the trail. At first glance we were sure what it was. We then started to think it was a deer. Upon getting a bit closer we came to realize it was a dog running ahead of it's party. We called down the trail to the owners to let them know we were there and that we had a dog as well. At this point they leashed their dog and proceeded to pass us. We let the dogs sniff each other for a minute and exchanges some pleasent words with each other. At the end of the exchange the owner of the other dog must have gotten scared or thought that the dogs might begin to fight with each other. It was at this moment the women decided to dash off with her dog and immediately trip over the hound when it darted in front of her. I stood there shocked and concerned for her well being all the while trying to stifle a laugh that was building inside me. She got up and brushed herself off and assured me that she was okay and that it was regular for her and her friend to take falls on trails. It appears the only thing that might have been hurt was her pride. With that out of the way they went on down the trail as we continued back out. Of course prior to this point we had reached our destination at the O&W bridge. This is a trestle bridge that was once used by the O&W (Oneida & Western) Railroad, which was used to run coal and timber from the area. The area here is absolutely beautiful. From the bridge you can really see the bluffs and gaze upon the rushing white water of the Big South Fork of the Cumberland River. We had stopped here for a breather and a snack. The kids decided to hunt rocks to which they tossed to the raging river below. I reckon this struck their fancy more than anything else that day. At this point you can head up to the Devil's Den which is a tough half mile hike up to a beautiful water fall. Considering that both kids were either just getting over or coming down with colds, we decided that this day we would forgo that side trip and head back out. When we made it back out to the parking area, we found us a picnic table with a grill and treated ourselves to a well deserved hot dog lunch complete with chips, bananas, and potato salad. We were all relieved to kick our boots/shoes off and don our flip flops to let our feet receive much needed fresh air. Once our bellies were full, we packed up and headed back home. As for other trail details, it is an easy to moderate trail. 4.6 mile out and back. The elevation gain is minimal unless you add the .5 miles for Devil's Den. Total time was approx. 3 hours which included the stop at the Bridge and water breaks in between. This a definite must hike and easy for the youngins. If you want something a little easier, there is the Angel Falls trail on the other side of the parking area.